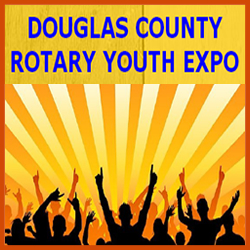 Douglas County Rotary Clubs are organizing a great event to show Kids and the Parents Services, Products and Activities that are available in Douglas County Colorado! All under one roof! February 23 at the Douglas County Event Center in Castle Rock. The event will include exhibitors related to Sports, Motivation, Special Needs, Art, Education, Counseling, Clubs, Volunteering, Health and Wellness and much more. We will Face Painting, Speakers, a Magician, Freebies and much more!